The Angriest: Star Trek: Voyager: "Tattoo"
It is 6 November 1995, and time for another episode of Star Trek: Voyager. While on an away mission, Chakotay (Robert Beltran) discovers a symbol carved into the rock that resembles one he first saw with his father in central America. In an attempt to discover how an ancient Native American inscription was made in the Delta Quadrant, Voyager follows a warp trail to another planet where Chakotay undertakes a spiritual journey that reminds him of his youth. From the outside, "Tattoo" really does not feel like an episode that should work. 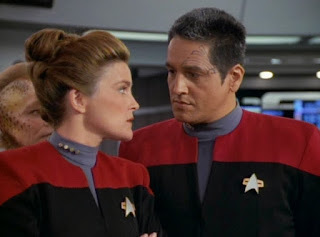 Chakotay's spirituality and Native American heritage have previously felt cursory at best, and sometimes even tokenistic. At the same time a comedic B-plot involving the Doctor (Robert Picardo) giving himself simulated influenza to demonstrate the human crew are weak and feeble sounds relatively dreadful. In practice the episode is a real surprise. Thanks largely to Picardo's comic talents, the Doctor's illness does generate some solid laughs. His panic when his illness continues longer than he intended it to is beautifully performed, and Picardo benefits hugely from Jennifer Lien's 'straight act' approach as Kes. Down on the mystery planet, Chakotay undergoes some genuine character development and gains some very welcome back story. Writer Michael Piller relies on regular flashbacks to parallel Chakotay's experience as both a teenager and as an adult man, and cleverly contrasts his attitudes then and now. It is refreshing to see he was not uniformly the spiritual and confident man he presents himself as in the present. Seeing his younger self refuse to engage with his own heritage and struggle to respect his father makes Chakotay a more rounded and satisfying character. The episode also gives Robert Beltran much more to work with than usual. He is Voyager's most under-utilised asset: a talented dramatic actor reduced to being serious and giving orders around the ship for seven seasons. On rare occasions such as this Beltran really showcases what an interesting character he could have developed had more writers given him material. It's a shame, but at least for this one episode it's a welcome break. This was a pleasant surprise, and a nicely enjoyable episode. It's the fourth good episode out of nine for Season 2, bringing the quality ratio up once again to 44 per cent; it's still not above 50/50, but it's getting closer.